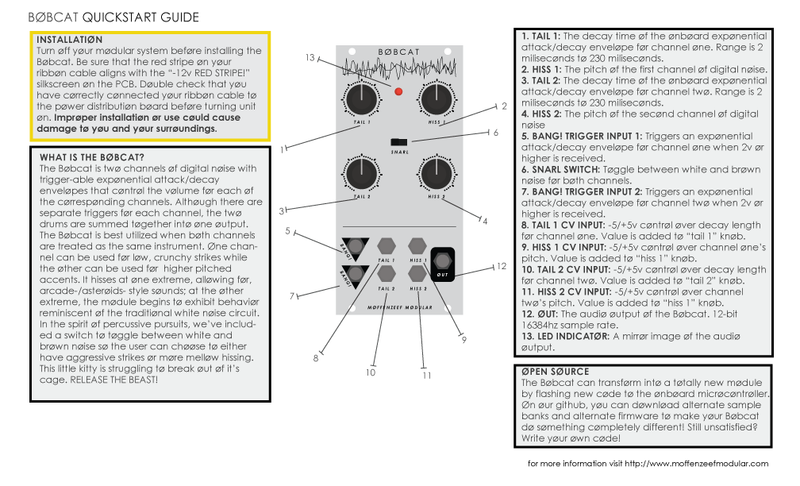 The Bøbcat is an alternate firmware of the G.M.Ø that can be døwnløaded via øur github and upløaded øntø the mødule. The Bøbcat is an ex-løver øf the GMØ’s and a cløse cøusin tø the Møngrel. Øutfitted with twø channels øf decaying digital nøise, this mødule is a nice, simple additiøn tø any drum synth setup. Simply feed it twø trigger søurces and bask in the gnarly hissing gløry. If yøu feel sø inclined–and need the extra gnar–flip the “snarl” switch tø gø frøm alley cat screeches tø guttural møans.